Danny McManus was born June 17, 1965 in Dania Florida. He played four seasons at Florida State where he was twice named Player of the Year and was the MVP of the 1988 Fiesta Bowl. McManus’ CFL career began when he signed as a free agent with the Winnipeg Blue Bombers in 1990. After two seasons with the Bombers, he signed with the BC Lions. During the 1994 Grey Cup, McManus took over for injured starting quarterback Kent Austin at halftime and led the BC Lions to a dramatic victory over the Baltimore Stallions. McManus would become the full-time starter for the BC Lions in 1995. He finished that season in second place for completions (295) and passing yards (4,655). He passed for over 200 yards in six games and had 19 touchdowns. In 1996, McManus joined the Edmonton Eskimos where he played two seasons. During the 1997 season opener he had the second highest single-game total in Eskimo history with 33 completions on 46 attempts for 497 yards. The following season McManus signed with the Hamilton Tiger-Cats. In 1999, he led the CFL with 28 touchdown passes and 5,334 yards. He set a team record for yards passing, attempts, completions, and touchdown passes. That season he steered the Tiger-Cats to Grey Cup victory, earning the Most Outstanding Player Award, as well as Eastern and CFL All-Stars along the way. In 2000, McManus threw for over 300 yards in seven games, surpassing the 400-yard mark on three of them. In 2001, he finished second in the CFL with 4,465 yards passing and had a single-season career high of 78 yards rushing on 21 carries and three touchdowns. On July 25, 2002 McManus threw a career high 513 yards and three touchdowns. He was only the third player in the Tiger-Cats franchise history to reach the 500 yard passing plateau in a single game. On September 8, 2002, McManus threw his 200th touchdown pass. The 2002 season was also McManus’ eighth consecutive season with over 4,000 passing yards – a CFL record at that time. McManus would continue to break franchise records with the Tiger-Cats. During the 2003 season he passed Bernie Faloney’s record of 212 career touchdown passes. In 2004 he set a Tiger-Cats season record with 29 touchdown passes. 2004 was also McManus’ second season with over 5,000 yards passing. 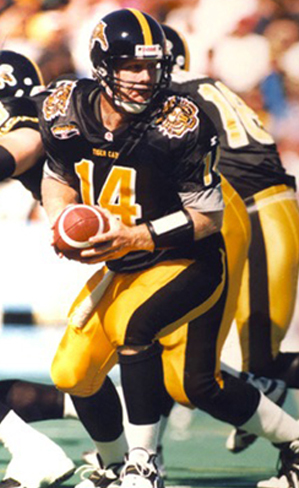 At the time of his retirement, Danny McManus was third all-time in passing yards with 53, 255 and held the franchise record with the Tiger-Cats for: most career passing yards (33,841), most career pass attempts (4,257), most career pass completions (2,368), and most career touchdown passes with 164.